We are headed back to Frankfort Springs on Sunday, weather permitting. You are welcome to come along. We are meeting at Dollar General at around 12:30pm in Calcutta. Bring a camera and wear some good shoes! Any one that is interested, we will be doing some Ghost Box Sessions and EVP sessions, too. As usual, it is free! Next weekend is packed for us. 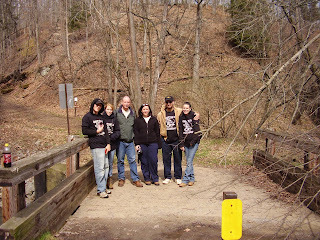 April 17 is the Jakes Lock tour, which is at Beaver Creek State Park at about 4 pm. We are walking back to Grey's, Vondergreens, Lock #39(Jake's Lock) and Lock #40, as well at taking a look at 5 foundations of homes or businesses that existed back in the 1800's. You will need a camera for this one, too. April 18 is the Grimms Bridge tour. Bring a camera, sturdy shoes, etc. Again, 4pm.